For the city in Vietnam, see Huế. For other uses, see Hue (disambiguation). For the 2016 video game, see Hue (video game). The hues in this image of a painted bunting are cyclically rotated over time. Hue is one of the main properties (called color appearance parameters) of a color, defined technically (in the CIECAM02 model), as "the degree to which a stimulus can be described as similar to or different from stimuli that are described as red, green, blue, and yellow", (which in certain theories of color vision are called unique hues). Hue can typically be represented quantitatively by a single number, often corresponding to an angular position around a central or neutral point or axis on a colorspace coordinate diagram (such as a chromaticity diagram) or color wheel, or by its dominant wavelength or that of its complementary color. The other color appearance parameters are colorfulness, saturation (also known as intensity or chroma), lightness, and brightness. 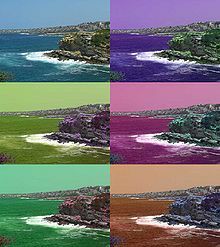 Usually, colors with the same hue are distinguished with adjectives referring to their lightness or colorfulness, such as with "light blue", "pastel blue", "vivid blue". Exceptions include brown, which is a dark orange. In painting color theory, a hue is a pure pigment—one without tint or shade (added white or black pigment, respectively). Hues are first processed in the brain in areas in the extended V4 called globs. In opponent color spaces in which two of the axes are perceptually orthogonal to lightness, such as the CIE 1976 (L*, a*, b*) (CIELAB) and 1976 (L*, u*, v*) (CIELUV) color spaces, hue may be computed together with chroma by converting these coordinates from rectangular form to polar form. Hue is the angular component of the polar representation, while chroma is the radial component. where, atan2 is a two-argument inverse tangent. Preucil used a polar plot, which he termed a color circle. Using R, G, and B, one may compute hue angle using the following scheme: determine which of the six possible orderings of R, G, and B prevail, then apply the formula given in the table below. , where H is the highest of R, G, and B; L is the lowest, and M is the mid one between the other two. This is referred to as the "Preucil hue error" and was used in the computation of mask strength in photomechanical color reproduction. Hue angles computed for the Preucil circle agree with the hue angle computed for the Preucil hexagon at integer multiples of 30° (red, yellow, green, cyan, blue, magenta, and the colors midway between contiguous pairs) and differ by approximately 1.2° at odd integer multiples of 15° (based on the circle formula), the maximal divergence between the two. The process of converting an RGB color into an HSL color space or HSV color space is usually based on a 6-piece piecewise mapping, treating the HSV cone as a hexacone, or the HSL double cone as a double hexacone. The formulae used are those in the table above. The hues exhibited by caramel colorings and beers are fairly limited in range. The Linner hue index is used to quantify the hue of such products. Manufacturers of pigments use the word hue, for example, "cadmium yellow (hue)" to indicate that the original pigmentation ingredient, often toxic, has been replaced by safer (or cheaper) alternatives whilst retaining the hue of the original. Replacements are often used for chromium, cadmium and alizarin. Dominant wavelength (or sometimes equivalent wavelength) is a physical analog to the perceptual attribute hue. On a chromaticity diagram, a line is drawn from a white point through the coordinates of the color in question, until it intersects the spectral locus. The wavelength at which the line intersects the spectrum locus is identified as the color's dominant wavelength if the point is on the same side of the white point as the spectral locus, and as the color's complementary wavelength if the point is on the opposite side. There exists some correspondence, more or less precise, between hue values and color terms (names). One approach in color science is to use traditional color terms but try to give them more precise definitions. See spectral color#Table of spectral or near-spectral colors for names of highly saturated colors with the hue from ≈ 0° (red) up to ≈ 275° (violet), and line of purples#Table of highly-saturated purple colors for color terms of the remaining part of the color wheel. Alternative approach is to use a systematic notation. It can be a standard angle notation for certain color model such as HSL/HSV mentioned above, CIELUV, or CIECAM02. Alphanumeric notations such as of Munsell color system, NCS, and Pantone Matching System are also used. ^ Mark Fairchild, "Color Appearance Models: CIECAM02 and Beyond". Tutorial slides for IS&T/SID 12th Color Imaging Conference. ^ "Hue, Value, Saturation | learn". Archived from the original on 2017-06-30. Retrieved October 27, 2017. ^ C J Bartleson, "Brown". Color Research and Application, 1 : 4, p 181-191 (1976). ^ "The Color Wheel and Color Theory". Creative Curio. 2008-05-16. Archived from the original on 2011-07-05. Retrieved 2011-06-09. ^ Conway, BR; Moeller, S; Tsao, DY. (2007). "Specialized color modules in macaque extrastriate cortex". Neuron. 56 (3): 560–73. doi:10.1016/j.neuron.2007.10.008. PMID 17988638. ^ Conway, BR; Tsao, DY (2009). "Color-tuned neurons are spatially clustered according to color preference within alert macaque posterior inferior temporal cortex". Proceedings of the National Academy of Sciences of the United States of America. 106 (42): 18034–9. doi:10.1073/pnas.0810943106. PMC 2764907. PMID 19805195. ^ a b Colorimetry, second edition: CIE Publication 15.2. Vienna: Bureau Central of the CIE, 1986. ^ a b Frank Preucil, "Color Hue and Ink Transfer … Their Relation to Perfect Reproduction, TAGA Proceedings, p 102-110 (1953). ^ Miles Southworth, Color Separation Techniques, second edition. Livonia, New York: Graphic Arts Publishing, 1979. ^ Max K. Agoston (2004). Computer Graphics and Geometric Modelling v. 1: Implementation and Algorithms. Springer. pp. 301–304. ISBN 1-85233-818-0. Archived from the original on 2017-03-21. ^ Deane B Judd and Günter Wyszecki, Color in Business, Science, and Industry. New York: Wiley, 1976.